14 August 2016, Belgium ~ Sartejano will be looking to win another HH Sheikha Fatima Bint Mubarak race as Hippodrome Wellington in Ostend Belgium plays host to two premier races of the HH Sheikh Mansoor Bin Zayed Al Nahyan Global Arabian Horse Flat Racing Festival on Monday, 15 August 2016. Al Mahdod and stablemate Al Nashmi, both trained by Elizabeth Bernard and representing the Al Shaqab Racing in Qatar, will be battling it out again in the Sheikh Zayed Bin Sultan Al Nahyan Cup (Group 3). The race between the two from the Bernard training barn had resulted in a 1-2 in the President Of The U.A.E. Cup (Group 3) at the same Ostend racecourse on 2 August with Al Mahdod taking the top spot in that event. They are back to race over 1800-metres for a slice of the Euros 35,000 on offer with Qatari jockey Bughenaim on Al Mahdod, who won by a neck in that first race, looking to grab his second Group success in Europe, while Al Nashmi under Thomas Messina will be hoping the extra furlong in Monday’s race will help him upset his stablemate. Richard Mullen will be on Fajr Qardabiyah, who finished third behind Al Mahdod and Al Nashmi in the 2 August race. Also in the line-up are Nil Ashal (Sybylle Vogt), Sha’Hir (Mikhael Forest), Shrek OA (Anna van den Troost), Toutatix (Per-hans Graberg) and Hurra (Anthony Deau). Before the Sheikh Zayed Bin Sultan Al Nahyan Cup (Group 3), the Festival’s HH Sheikha Fatima Bint Mubarak Ladies World Championship will send another winning lady jockey to the 6 November final in Abu Dhabi. The 1000-metre sprint with a prize fund of Euros 30,000 will have the game Sartejano under Denmark’s Sabina Gammelgaard bidding to win his second race in nine days. 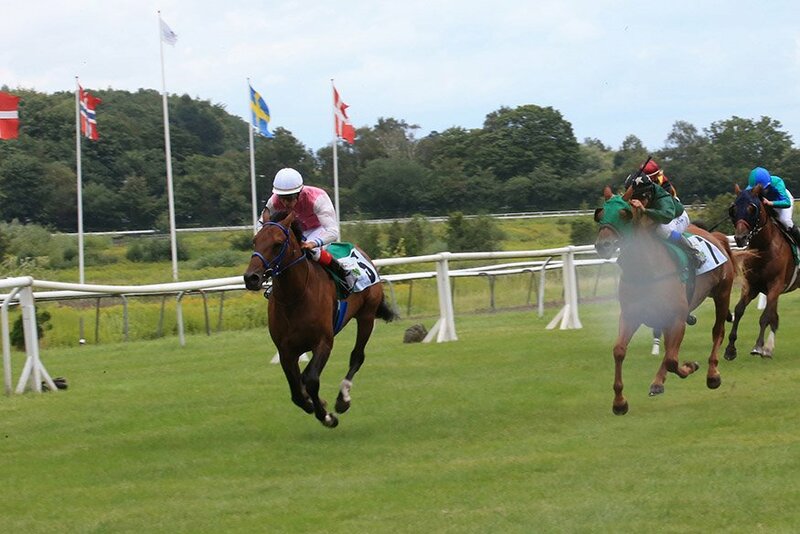 On 7 August, the 9-year-old Sartejano carrying Italian Apprentice jockey Daniel Scipioni won the HH Sheikha Fatima Bint Mubarak Apprentice World Championship race at the Klampenborg Racecourse in Copenhagen, Denmark.That win came after a long drought but the Diana Dorenburg-trained Sartejano will be under the Danish lady jockey who won the Bahraini leg of 2015 Ladies Championship and will be bidding to qualify again this year. Host, Belgium, will be cheering for Macallan under Belgian Anne Engels in the full field. Messi under Great Britain’s Catherine Walton is a strong contender as is Omani jockey Azhar Al Wardi riding Fareedha. Other runners and riders are: L’Eau Du Tigre under Peelman; Maghazi under Li De Blende; Nero D.A under Norway’s Thea Hofassaeter; Nil Aziz under Ireland’s Evanna McCutcheon; Nobas D.A under Spain’s Beatriz Alonso; Cali De L’Ardus under Italy’s Jessica Marcialis; HB Ma’Aish under Poland’s Kamila Maryniak; Badia under Germany’s Stefanie Hofer; and D.A Orage under Bertiaux.